While I was going back through blog posts - I realized that I started this post back in June, but never actually finished it!! Major fail. Well, better late than never! Here's a quick recap of our amazing trip to Alaska with Bryan's family. In early June, Bryan and I had the privilege of going to Alaska with his family, including his parents, brother and sister-in-law and their 2 year old son! We flew into Vancouver, Canada and had fun experiencing the city for a day and a half! I LOVED Vancouver and would like to go back one day! It was such a diverse city; I felt like I was in Europe and Asia at the same time! We got on the ship on Saturday afternoon for a weeklong cruise up the coast of Alaska! 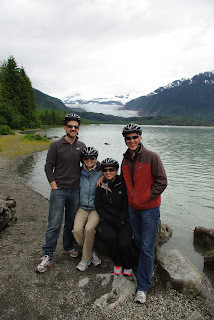 "Bike and Brew" excursion around Mendenhall Lake, Juneau, Alaska. Enjoying the view with my sister-in-law! This trip was such an amazing experience for both Bryan and me. We had a wonderful time, felt so blessed and lucky to have a wonderful family to spend it with, and are so thankful for the opportunity to go along! Thanks to the Hinck Parents for such an amazing trip!